A business information website run jointly by organizations including the Chambers of Commerce and Industry around Japan. Information on about 300 thousands Japanese companies’ business needs and interests. It is possible to search the latest technologies and products of the manufacturing companies of Osaka that are exhibiting at MOBIO. It is possible to search companies with high level and specialized technologies. 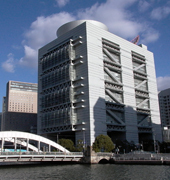 It is possible to search the biotechnology related businesses, organizations and facility names in Osaka Prefecture. Osaka has large-scale conference and exhibition halls and each year an average of 150 international conferences and trade fairs are held.